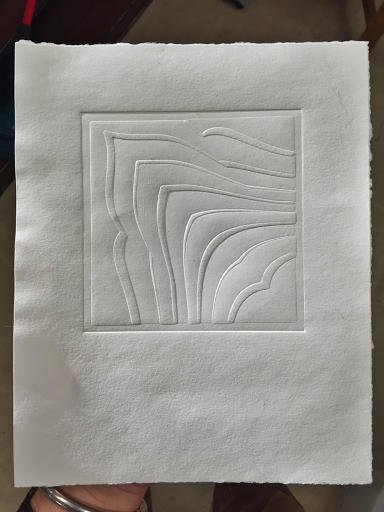 After lots of other advances in the printmaking studio, it’s time to sit down and do what I came here for – woodblock printing. I’ve had some time to integrate many of the things that I saw at SGCI and now, with a bigger, better press, I’m ready to start trying some of them. From now until July, I’ll be focusing on color work so that I’m prepared to make the most of my time in Nebraska. 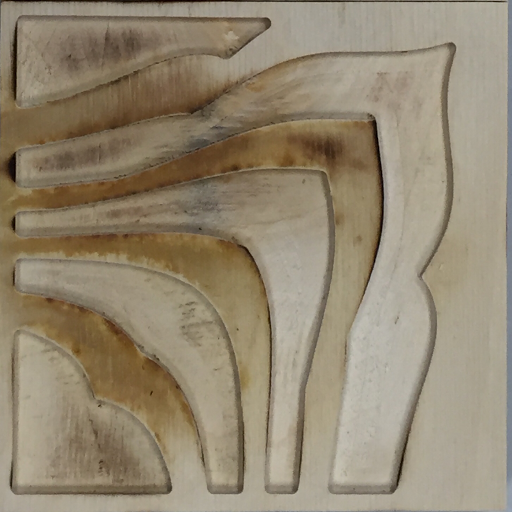 To that end, I’m carving some new plates of simple geometric designs. Then, I’ll be able to focus on color effects without the distraction of pictorial imagery. 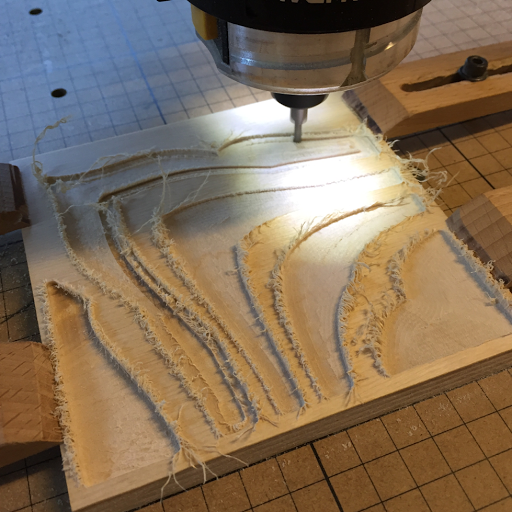 The first thing I wanted to try was carving with a straight-sided bit instead of the V-bit that I’ve been using. It would make the carving process way more flexible. As it stands, a variation on the order of 1/1000th of an inch makes a big difference in the results because depth equals width with a 45-degree V-bit. At first, the results looked abysmal. Look at those splinters! I think that it’s splintering because the bit is so small. A larger bit slices the splinters off and removes them. 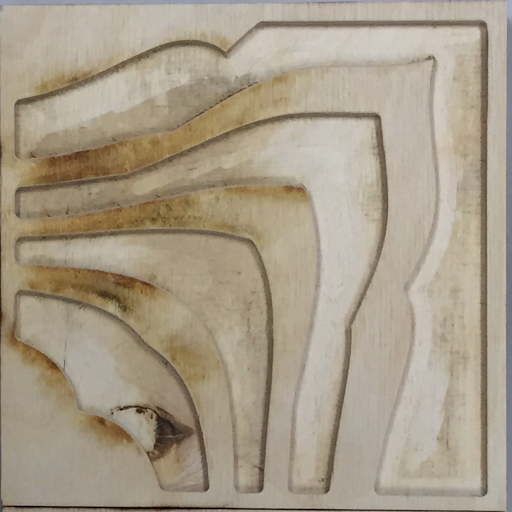 It seems that a few seconds with a blow torch can remove most of the splinters without damaging the printing surface. It’s a little hard to see what’s going on here. There are two blocks carved to match. 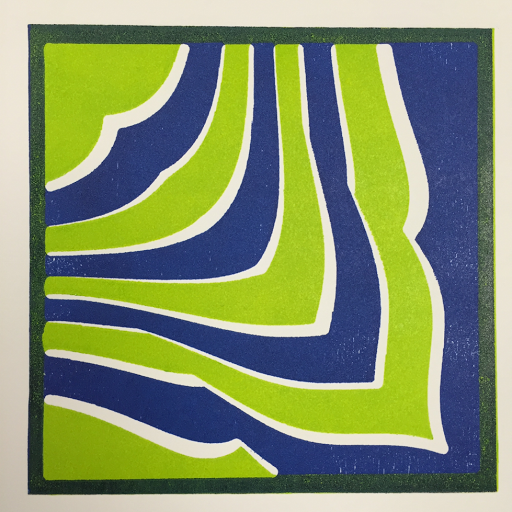 The printed areas in the second plate fit neatly into the spaces between the printed areas in the first plate. There is a narrow and variable gap between the two sets of stripes for a little added interest. Once I saw that the patterns really did nest in the way that they were designed to, it was time to ink them. Next, I wanted to try something I’ve never done before. 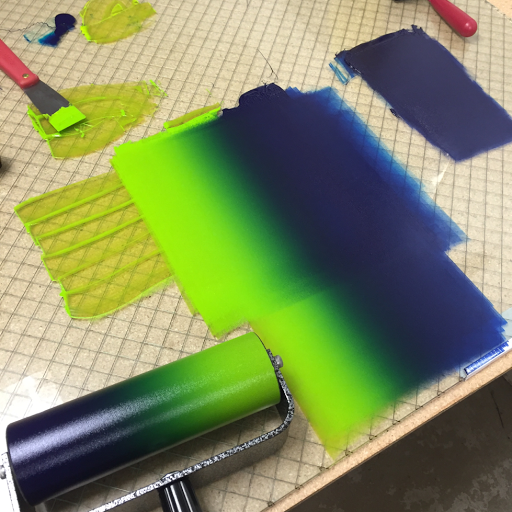 At SGCI, I invested in a brayer with a wide diameter. 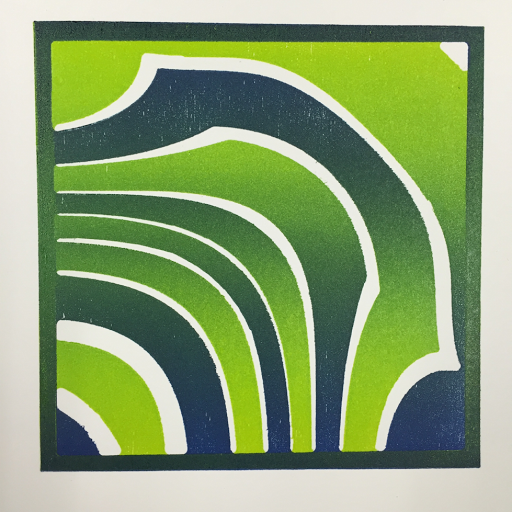 This enables a technique called “split fountain” or “rainbow roll” because with these techniques the brayer is only rolled in one orientation on the block. 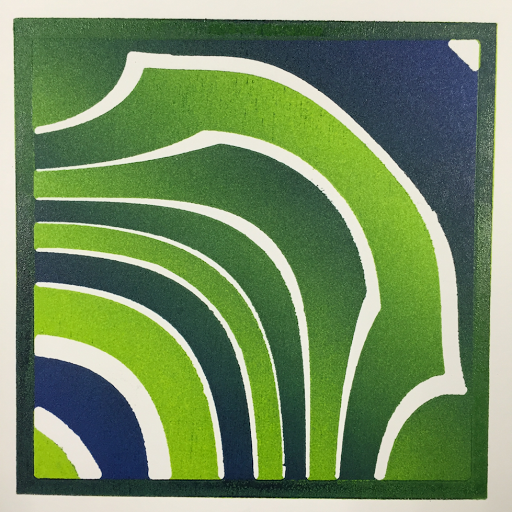 A small brayer can’t ink the whole plate because the roller has to rotate more than once so it inks the plate unevenly. In split fountain, you are pulling from two pools of ink and blending them together on the slab. I have a lot to learn about the mechanics of managing the ink if I decide to use this technique very much, but my initial results are so promising that I think I will use it. Orientation of the gradient makes a huge difference. I think that the horizontal gradient in the first image above feels slightly awkward. The diagonal gradient makes a symmetrical image and just feels more balanced. On the whole, I feel like this geometric color exploration holds some real promise artistically. I’m going to go down this path for a while and see what I can learn!